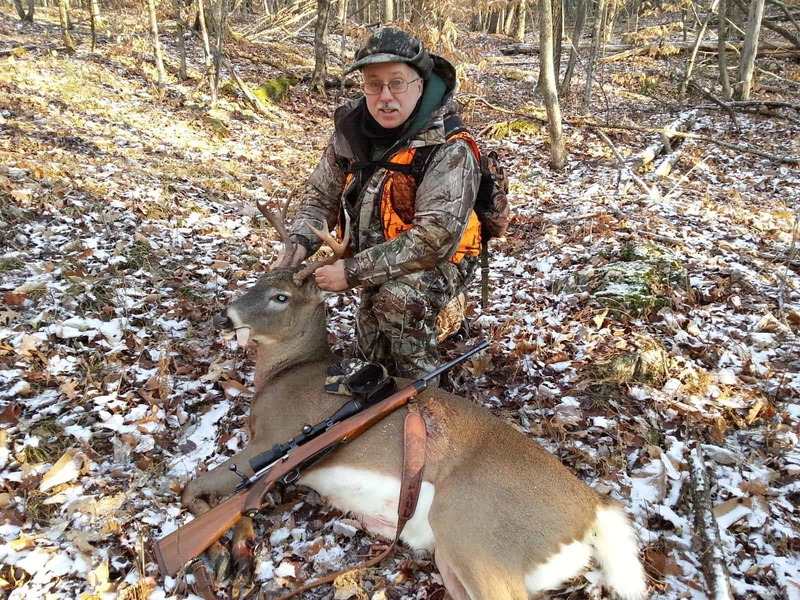 NH Rifle: Hunt 1-Double Up! - the4pointer.com | Real Hunts. Unreal Stories. 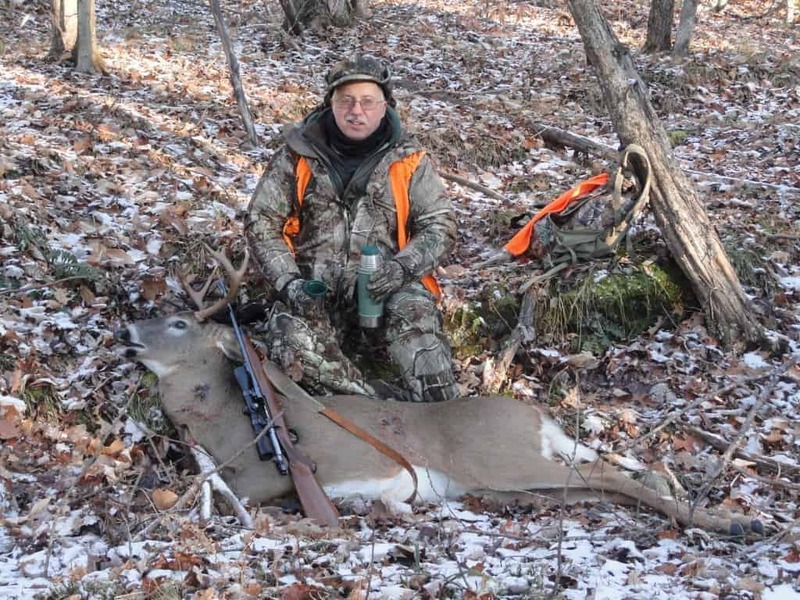 NH Rifle: Hunt 1-Double Up! Wednesday, November 13th marked the opening day of Rifle season in New Hampshire and the night before I was more excited than I had been in a long time. So excited, in fact, I even wrote a poem about the night before rifle season. 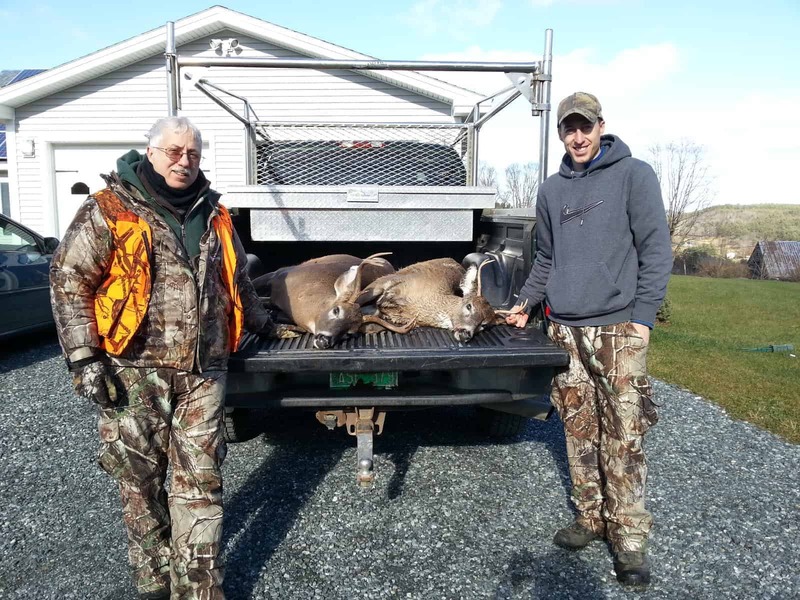 As was our usual custom, Dad and I were skipping work for the opening hunt. My plan was to be back to the office by 11 but that didn’t happen. First light found me perched at the intersection of two logging roads. I had good shooting lanes perpendicular to the direction the deer would be travelling. The weather was cold and breezy with a white coating of snow on the leaves. It was a perfect opening morning set up. Dad was further down the ridge poised at the ready for whatever crossed over at his end. Josh couldn’t take the morning off but wanted text updates of how the morning progressed. Christian was at it too, texting me before school began (he is a music teacher) also asking for updates. Even though we have all been hunting since September 15th there is just something special about opening morning and the excitement was palpable. A lone shot rang out from Dad’s direction around 6:50am. “Yup” was all I got in return and then nothing for a couple minutes. The suspense was killing me. What?! ?” I texted. I like to use punctuation marks. It really gets the point across…. Like, hey Dad, tell me what you shot already! Does were in season for two days but he told me he wasn’t going to shoot one and was instead going to hold out for a buck. I’ve heard this before but I believed him for some reason this year. “6 pt I think” he finally responded. Then I called him and he said he wasn’t totally sure of the shot. He felt good about it but the deer had run out of sight. Not one for sitting in the cold with so much action happening elsewhere, I told him I would hunt my way over to him and help him out. I hunted to him at the pace of a fast sprint and arrived a few minutes later to find Dad standing where he thought the deer was when he shot. I’m not sure why I didn’t see any deer on the way there. Truth is, if there were deer nearby they probably didn’t see me either. Dad and I sat on his buck for an hour or so and then cleaned it up and started the long drag back. The light snow made the drag easy and halfway back to the truck I told Dad I wanted to hunt my way back. This time I actually did hunt my way back and as I slowly hunted over the crest of a hill I noticed I young buck feeding about 80 yards away. It was decision time. Obviously, I knew the buck was not a wall hanger. I had wanted to hold out for a bigger buck but I had never thought Dad and I would have a chance to score a double either. Then just like that the buck turned slightly and my gun went off. Go figure. There are some things you just can’t prevent and making good memories is one of them. My gun continued to go off after that but it doesn’t really matter how many times. 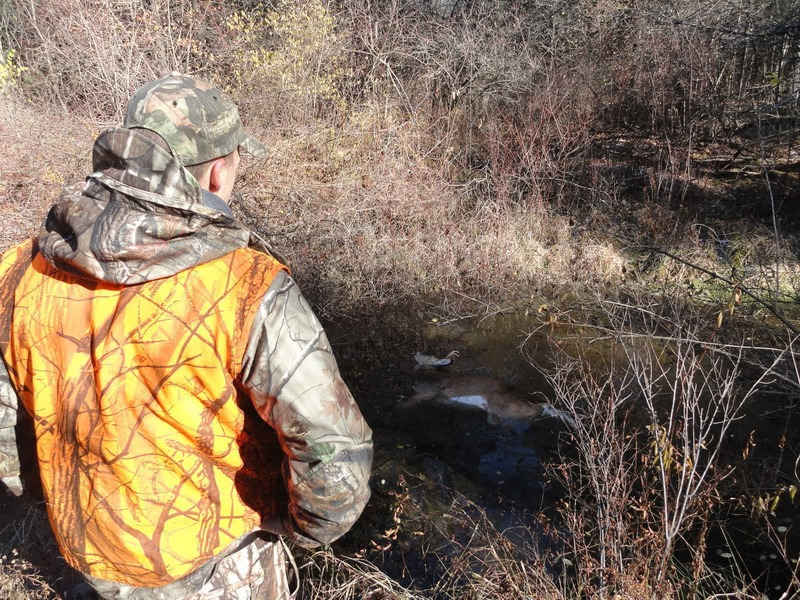 What matters is that the buck eventually succumbed to my fourth shot and gifted me by dying in the middle of small natural pond just deep enough that I couldn’t wade into it. Dad and I made some impromptu lassos and dragged him out of the water. I cleaned him out and then we loaded up our bucks and headed to Claremont to check them in. Of course, we did make a few stops along the way. I had to show my wife and son. Steph took a picture of us and Sam said “Deer Yucky” and “Papa’s deer bigger” or something silly like that. Whatever, he’s two, it’s difficult to always understand what a two year old is saying. There was a biologist at the check station and after sorrowfully informing her I wouldn’t be mounting my deer this year she sliced the cheeks open and aged both bucks to be 2.5 years old. I found that to be very interesting because the deer present themselves very different. Dad’s had a nice rack for a 2.5 yr old while mine, obviously the runt, struggled to make a lasting impression. Dad’s deer also weighed in at 138 lbs while mine 122 lbs. Once again I found myself thankful for the fire station scales for weighing in my deer heavier than I thought it would weigh. In the end, it was a day that Dad and I will surely never forget. We starting making memories like this when I would skip school for opening day when I was just in Junior high. I’ve always hoped to kill two deer on the same day but until now it’s never happened. Now that it has, I’ll have to set my sights on a slightly larger buck so the next time we stop by to show them off I can puff my chest out a little more. Either that or Dad needs to shoot one with a full 8 points. I’ll gladly take either one if we ever get another chance. 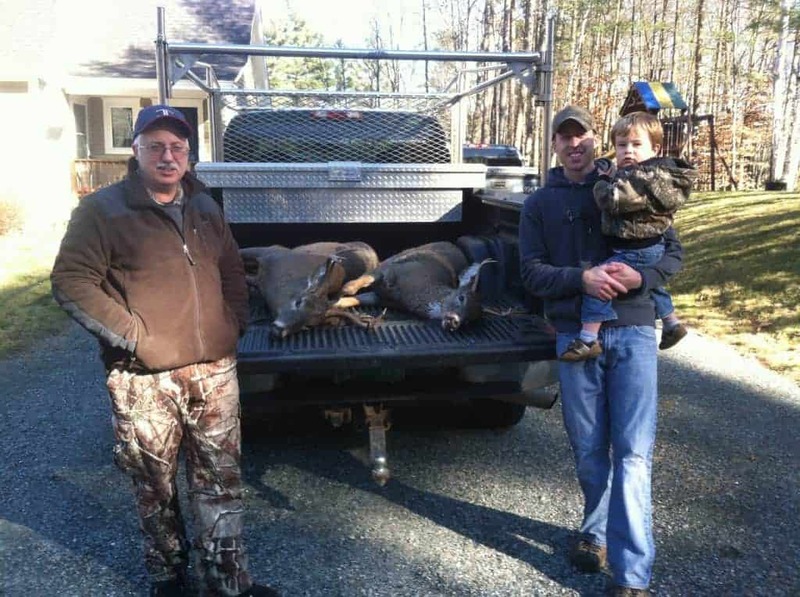 Need more entertaining deer stories delivered right to your inbox? You can always subscribe so you don’t miss a post!